The last time I had such a clear vision for my future, it all came true – so I am pretty stoked at what I’ve got ahead of me. Continue my adventures and fun throughout the globe. So, when it was time for the festival’s cacao ceremony – my first such ceremony and something I’ve been looking forward to since I first read about it – I knew specifically the four kinds of abundance I wanted for myself. Me working. “You are not retired, Suzanne,” I like to constantly remind myself when it seems like everyone around me is having fun and I’m behind the computer. But I recognized, also from yesterday’s life coaching workshop, that I had some fear associated with the second part of this plan. Part of me worried that I wouldn’t have enough time to create the projects I have in mind. I work every day: Fellow festival participants may have seen me plugging away at my computer in the corner while they are working on their asana alignment and laughing over smoothies. I know that my vision of optimal health will result in more energy and a stronger ability to prioritize my time toward the things that I want to have happen. Still, I was holding on to what I think is lingering fear trickling down from my parents, who always ask nervously if I’m working when I call to catch up. Maybe they think I’m just chilling in Bali or Korea or Argentina or Australia and am eating through my savings. It may be hard to imagine, but I’m actually adding to my savings. And yet … part of me worried about this. 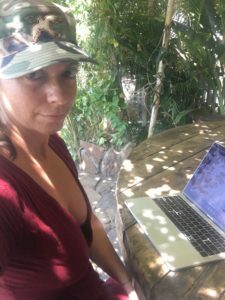 Imagine my surprise, then, during the middle of the cacao ceremony, when I pick the angel card, “Moonlighting.” The card instructed me not to worry, that I can “work part-time on my dream job while still doing my current work.” It spoke directly to my fear. It brought tears to my eyes. Angels are always looking out for me, and here again are my higher beings, confronting me in the middle of a ceremony where I was dancing around and feeling free. I could have flown away. This whole week has been magical for me, but today was just amazing. Earlier, I led another SUP Yoga class. As I was hurrying to get the boards rinsed off and away, I explained to my students that I might have another yoga class to teach on the other side of Amed. 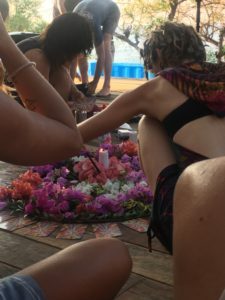 More service: Ladies create a flower mandala with candles before the cacao ceremony. Note the angel cards around the edge. “You certainly know how to teach,” one said to me. It was more than enough payment for a class that I taught only for the hope that my students would donate to the good, local non-profit agencies that are benefiting completely from this entire festival. I try to focus as much of my life as possible to service. When a friend complained of sore shoulders today, I happily massaged her. When another new friend asked me to share the practice I was doing to rid myself of the poisons in my life and make way for new, healthier things, I stopped working and chatted with her. When a presenter asked me to fetch some new dry erase markers, I ran. When organizers needed someone to hang flyers, I volunteered. Need help with a daily blog post about what I’m getting out of this wonderful, free yoga festival? I’m in. I am here to help: This is one of my mantras. In return, I get all the help I need. This week has been just that: the space, opportunities and healing work that I needed to create a vision for myself for the next year. And the most amazing thing of all? When I told my boyfriend my new four-part plan, he was stunned. It was exactly his vision for himself as well. It was as if we had found each other to help make our visions reality. Which means, of course, that it’s already happening. Without love in the dream, it’ll never come true! 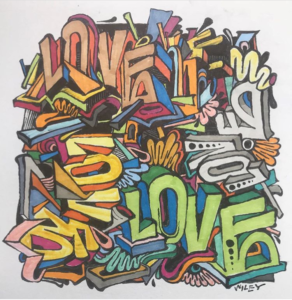 Part of my vision, as illustrated by the artist Wiley. Five years ago, I had another four-part plan that arose from a deep meditation session. I decided to create a geographically independent career, which included becoming a yoga teacher and completing my training as a Reiki master. (I hadn’t heard of the team “digital nomad” at that point.) I decided to focus on nutrition, which resulted in adopting veganism for two years and then experimenting with a variety of fasting regimes. And I envisioned moving some place new. Little did I realize at the time that I would be moving to 12 different countries (another one in two weeks) in just a few years. My vision had created a reality for me that was beyond what I could have imagined. So, what will come of my current vision? You can see now why I was so excited that I danced around a cacao ceremony. Protected, loved and grateful for all my years that brought such wisdom and experience, I am blessed and ready for the miracles my future will bring. And my future includes one more day of the Ocean Yoga Festival, too … more yoga to practice, another SUP Yoga class, Thai massage and more. But first – sleep!